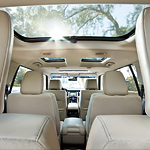 In a Ford Flex, you and up to six other passengers can enjoy a pleasant ride. This SUV that we offer at Honolulu Ford can appeal to anyone looking for a three-row vehicle that's easy to maneuver around Honolulu. There's plenty of space in the SUV to hold all of your things. When all the seats in the back are folded down, there is an impressive 83.2 cubic feet of storage room. The seats are simple to arrange; the second row comes standard with a 60/40 split bench, and the third row is a 50/50 split bench. If you'd like, you can put in a PowerFold third-row seat for quicker adjustments. If only six people are going to ride in the Flex, you can opt to put in bucket seats in the middle row. This opens up a pass-through that lets people move around more easily.